Washington, DC, has been one of the foremost laboratories for tech-driven innovations in the transport sector. The city implemented North America’s first bike-share system, and most recently it welcomed companies to experiment with the latest transport trend: “micro mobility,” or small vehicles, such as shared dockless bicycles and scooters, that are often battery powered. 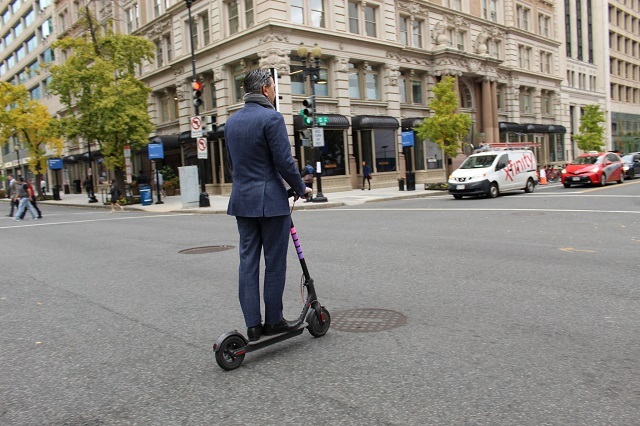 In September 2017, DC launched a 15-month dockless demonstration program, with the eventual participation of eight private companies: Bird, Jump, Lime, Lyft, Mobike, ofo, Skip and Spin. Although initially focused almost entirely on regular pedal bikes, most of these companies switched to e-bikes and e-scooters over the last year. Others left the city entirely, arguing the pilot program’s cap of 400 vehicles per operator was crippling their business. The District Department of Transportation (DDOT) has now released its first evaluation of the program, showing how many people have used the system, how it’s affected the city’s docked bike-share system and how many crashes have been reported. There are many more people biking and scooting in DC! During the period of evaluation, companies reported 625,000 trips by 233,700 users (an important caveat: some riders may have used multiple services and therefore were counted twice). Although we don’t know from what transport mode users came from, the introduction of dockless bikes doesn’t seem to have significantly affected usage of the city’s docked system, Capital Bikeshare. Overall this is an indication of more people using shared and active modes of transport. The idea that Capital Bikeshare has been largely unaffected by the wave of dockless bicycle and e-scooters is reinforced by time usage patterns. 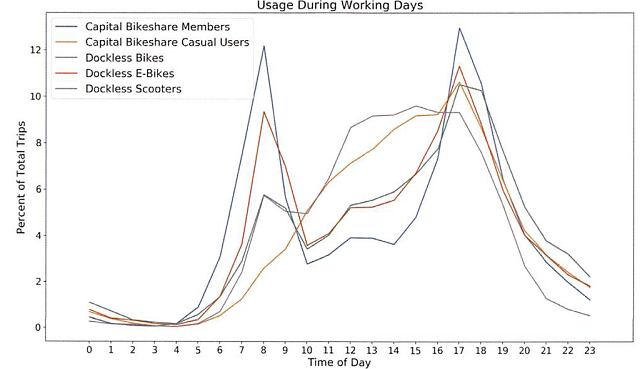 Regular Capital Bikeshare users seem to follow a predictable commuting pattern, but the usage of dockless modes (especially scooters) is more spaced out throughout the day, with less dramatic peaks and valleys. Overall, the report indicates there is strong support for continuation of the pilot program. Indeed, people reported wanting more vehicles available and additional infrastructure to support them. One of the promises of dockless bikes and scooters is that they can go anywhere, improving access to mobility for communities that are currently underserved by docked systems. But the data for DC shows little difference in terms of where the systems are used. 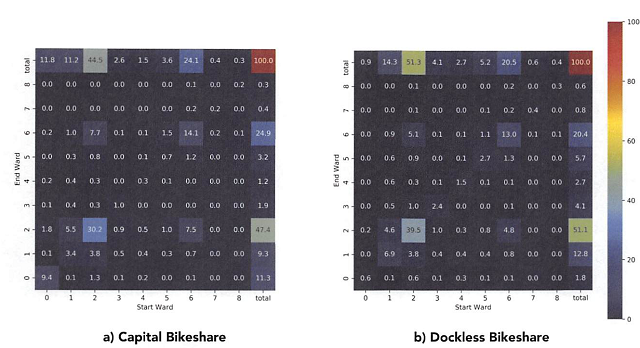 DDOT’s heat maps show similar start and end locations for both docked and dockless systems, meaning that underserved communities are not using dockless systems significantly more than docked systems. And as the pilot ramped up over the last year, so did the number of crashes and injuries. There have been 30 reported crashes and injuries and one death in DC involving dockless bicycles and scooters. Many cities have expressed concern over the road safety implications of new dockless systems. Austin, Texas, will even launch an epidemiological study with the U.S. Centers for Disease Control to analyze the effect of these modes. 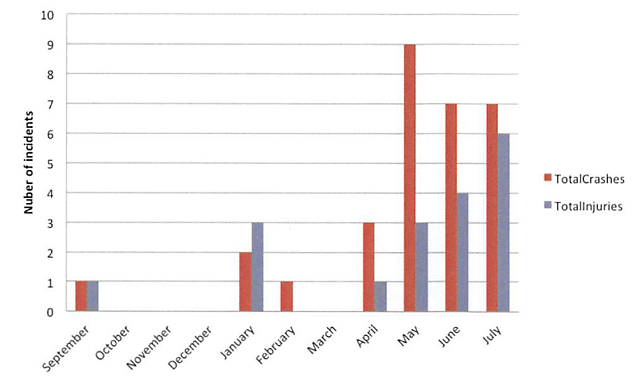 Considering that in Capital Bikeshare’s first 10 years of operation there were just 95 reported crashes with no deaths and there have been far fewer trips and vehicles in the dockless demonstration program, the report suggests safety is a very real cause for concern. Cities and companies need to do more to understand how to improve the safety of riders, pedestrians and other vehicles as micro-mobility services hit the streets. Small infrastructure changes can go a long way. A large criticism of micro-mobility is that it clutters city streets and sidewalks and is a nuisance. Despite first-hand encounters and vocal concerns, DDOT visual inspections showed that only 10 percent of dockless vehicles were parked in undesirable locations, of which only 3 percent was blocking pedestrian access. DDOT and some of the city’s business improvement districts have also increased the number of bicycle racks in the city, adding more than 400 racks in 2018. 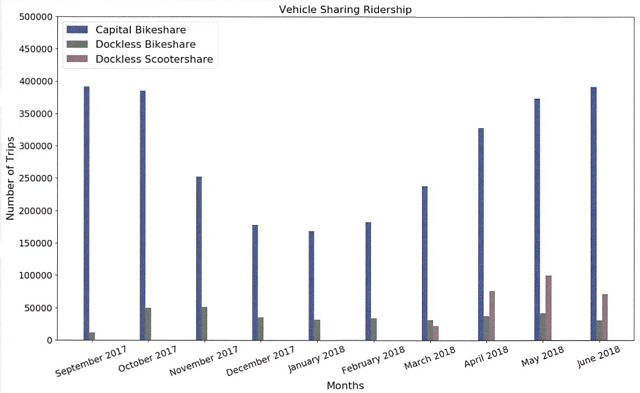 Although there doesn’t seem to be an indication of significant changes in Capital Bikeshare rides and revenue, the report mentions 126 Capital Bikeshare bikes were lost during the period, perhaps due to confusion by users who didn’t understand the difference between docked and dockless systems. What Can Other Cities Learn From DC? In the age of “new mobility,” cities are constantly being challenged by the arrival of new and unexpected vehicles on their roads. Although 2018’s mode du jour was e-scooters – in just a six month period during DC’s pilot, more than 90 percent of the city’s dockless pedal bikes were removed by their operating companies and electric assist models and scooters largely took their place – there is no guessing what will come next. With the release of this report, DC joins others, such as Charlotte and Portland, in sharing data with the public to help paint a clearer picture of the good, bad and ugly of micro-mobility. Los Angeles is working to create reporting standards too. But it’s still a relatively small sample size. Generating data and making it accessible to everyone will help community members, companies and decision-makers understand what these new modes can (and cannot) do, informing better decisions down the line. Correction, 1/7/19: The dockless demonstration program is a 15-month program and eight companies have participated to date. Clarifications were also made about the number of users of these services and the rapid transition to e-bikes and scooters. Sebastian Castellanos is an Energy and Climate Associate at WRI Ross Center for Sustainable Cities. Tags: active transport, bike-share, bike-sharing, Capital Bikeshare, Charlotte, D.C., DC Department of Transportation, DDOT, dockless, electric scooter, innovation, Los Angeles, micro-mobility, new mobility, Portland, scooters, Sebastian Castellanos, Washington, D.C.